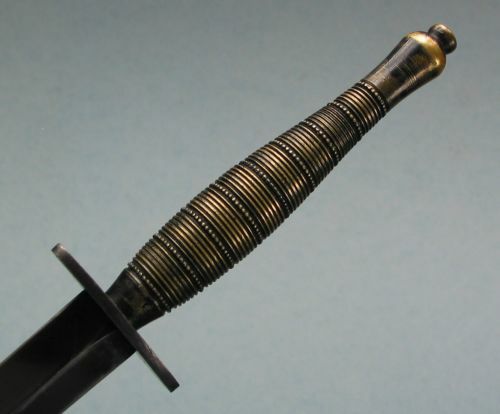 This section is dedicated to perhaps one of the most elegant of the variations on Second Pattern Knives, those referred to as Beaded and Ribbed. 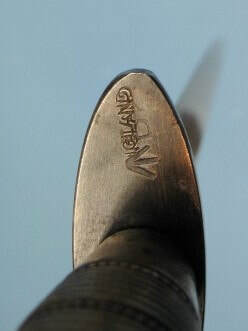 The handle turning has been often attributed to William Rodgers company. I cannot state that with certainty at this time. Whomever designed it created a lovely handle and a lot more work for themselves. There are at least three or four different variations on this handle as we shall see. Many of these were thought to be private purchase but many in our collection exhibit inspection stamps and the War Department broad arrow. 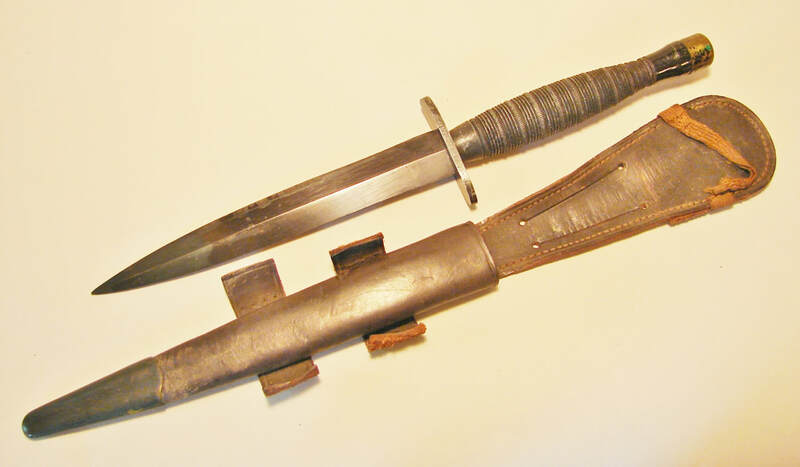 Below: The variant known as a Ribbed and Roped is one of the less common versions of the F-S knife. A friend in Canada offered these photos of a recent acquisition. Note the difference in the pommel areas. 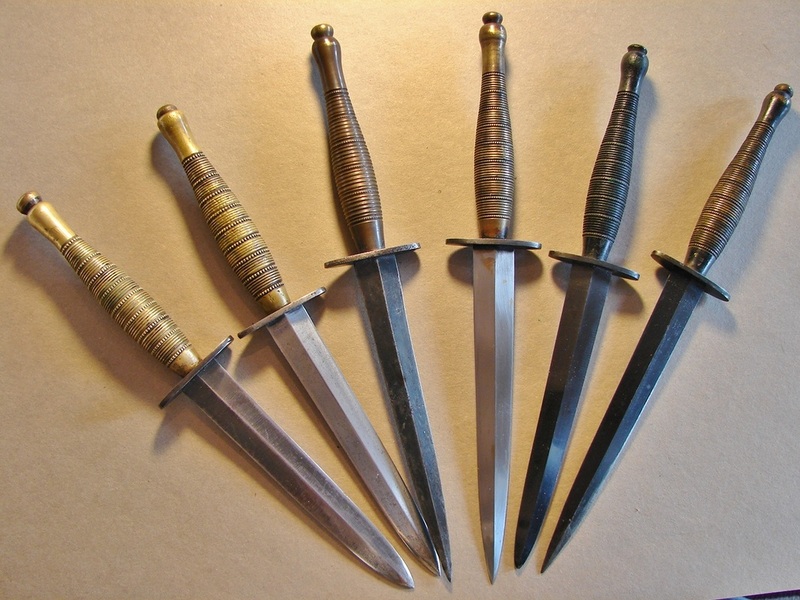 The top knife is the "standard" model. 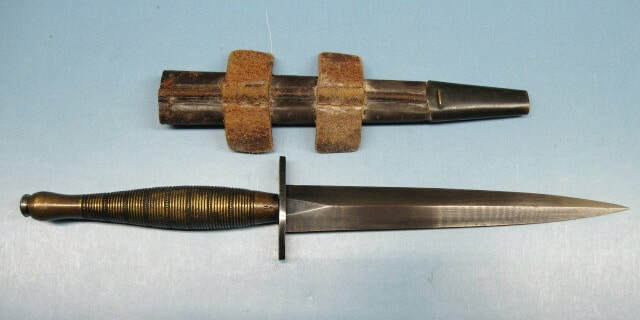 The bottom knife has had the cylindrical top nut of the standard version replaced by a smaller diameter top nut like those used on many 3rd pattern knives. There are all sorts of possibilities for the difference but like so many anomalies one seldom knows the reason. It is obvious the bottom knife either was never painted black, or the black has been polished off. I do not believe the manufacturer of these has ever been identified although some suggest Wm. Rodgers. Thank you Mike for use of the images. 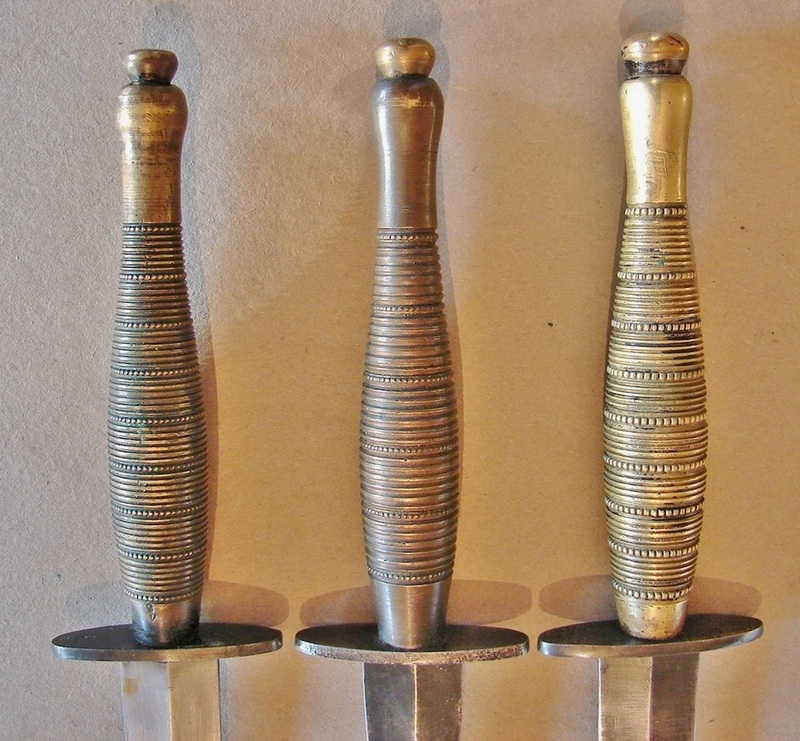 Note that these knives typically have the round ended steel guards, not the oval shaped ones. 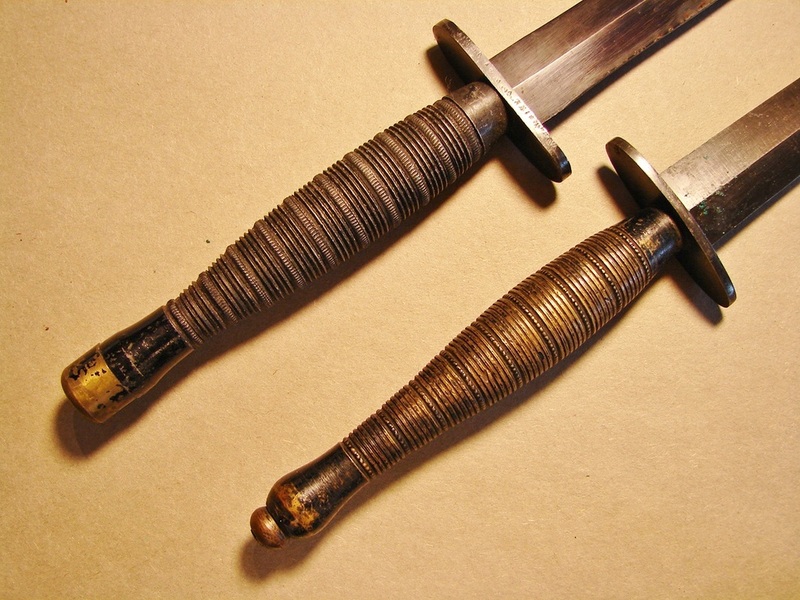 Some of the wood handled knives also used this style guard. Below: Another Ribbed and Roped version of F-S. Not the 3rd pattern style blade, finely finished but not as heavy as the 2nd pattern blades. Overall quality is usually very high. There is another version with more cogged-like rings, which may be the rarest of all. Below: This knife is a curiosity. It has a B2 guard with a Beaded & Ribbed handle. The handle is stamped "^12". It has obviously been apart, based on the top nut and short tang. How did this come about? Did the original B&R blade get broken and needed replacing? Or did the owner have a B2 and liked the look of the B&R handle better? But then who would take a perfectly good B&R apart for the handle? This is one of the heaviest and finest second pattern blades I have ever seen and I own quite a few. That is what induced me to buy the knife despite its mixed genes. I am going with the theory of the broken blade in need of replacing. Many of the B&R knives had thinner blades like a third pattern. Notice in the group photo of six knives at the bottom that 3 of them have broken and re-tipped blades. Maybe there was a heat treat problem with these blades because I seldom find a broken second pattern blade. Below: This Beaded and Ribbed knife has a much heavier, hand forged, and hand polished blade than most. Most of the bluish/black finish remains on the blade although nearly all of the black is worn off the handle. 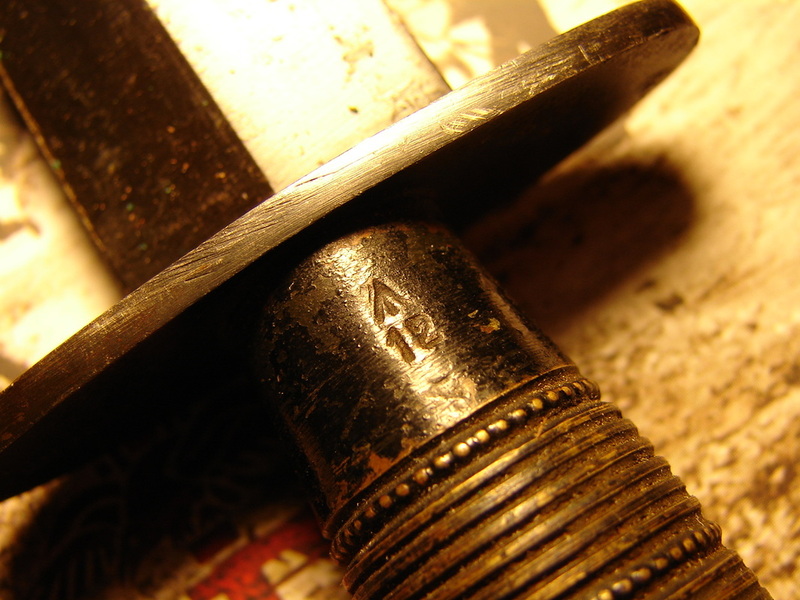 There are no marks other than the ^1 stamped into the handle near the guard. This indicates it was a personal bring-back, not imported. I believe the ^1 is the only example in our collection. All of the Beaded and Ribbed knives that I have seen were originally blackened. I have never seen a nickle plated one although that would be stunning. The blades tend to be the thinner variety and a large number of those I have seen had been broken and re-tipped. 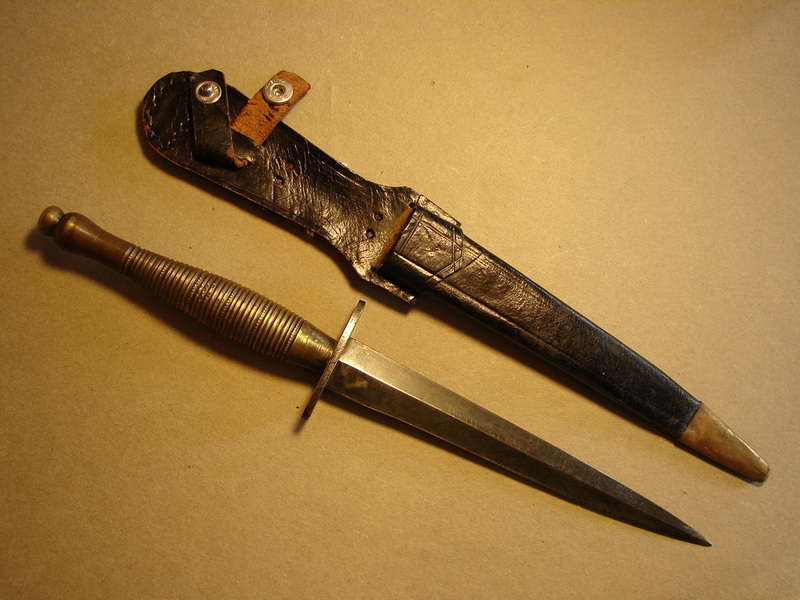 No sooner said, than Roy Shadbolt sold a nickel plated, beaded and ribbed knife. I was right, it was stunning! It would have made a nice addition to our collection, but even if I had the opportunity, I can't afford to buy all of them. Even more rare than the beaded and ribbed models are the version called Ribbed and Roped. Here are one of each side by side for comparison. 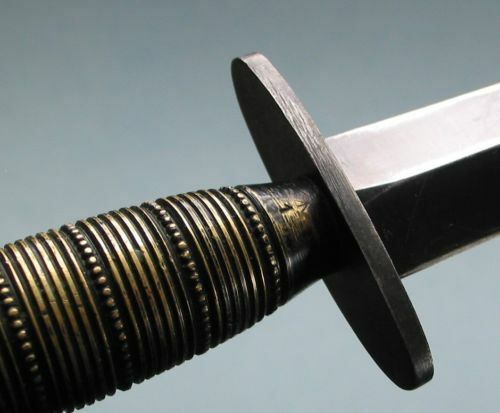 The Ribbed and Roped (top) have alloy handles usually capped by the oversize brass "nut" which is flush with the sides of the pommel. Shown below are three different Beaded and Ribbed handles. Each one has a distinctive number of ribs, and the ribs and beads are not shaped or spaced identically. You have to look closely to see the differences. This selection of six Beaded and Ribbed knives gives you an idea of the variations among this one genre. For example, look at the variety of top nuts. About the only piece that was made identical was the guards. Almost all of them have the thinner blades like the P-3 knives. The two on the far left and second from the right, have had their blades broken and coarsely re-tipped. There is even quite a difference in the knob on the ends of the handle causing me to wonder if they came from different molds or were just altered during cleaning up the castings. The castings do seem to be well done unlike some of the P-2 which had offset parting lines and were left as cast. Perhaps these handles were machined from bar stock?? If anyone has any info to share please email me.